Three Painters in Residence have used Bryant Park as inspiration so far this year: John Catania (August 3rd-14th), Susan Weintraub (August 17th-28th), and David Lee (September 1st-11th). We spoke to John last week about his time in the park, and this week we caught up with Susan Weintraub. Susan hard at work on her painting of William Cullen Bryant. Photo by Angelito Jusay. How did you choose your subjects? I was drawn to parts of the park where people could get away from everything and be alone. There was this garden where I saw a couple, and they seemed to be in pretty deep conversation. Or some people-- a couple of women, sitting around a table, early in the day--maybe before they started their day at work. I was very taken with those spaces. I did want to do the fountain. It had been fairly blocked from view because of the movie screen, so I kind of said, I don't think I'm going to try to get around that, there's plenty of other things to do, I'll see what happens. So the next to last day I was there, trying to decide what to paint, I was going to do this skyscraper over the lawn. They had started to take down a lot of the screen, and you had a fairly good view of the fountain at that point. And just as I was trying to decide what to paint, the fountain came on! All of a sudden there was water, and it was beautiful, and I think-- this is a sign! So that was why I ended up doing that on the last day. It's always a day to day decision based on the lighting, the weather, the shadows, so it's whatever looks the most appealing at that moment. Susan's fortuitous fountain picture, in the flesh! I started out as a plein air painter. I've always been a plein air painter until very recently. I just like the atmosphere when you're outside. One of the advantages I think of working outside is it's not just what you see. All of your senses get stimulated. There's sounds, and there's the temperature of the air, and there are smells. There are a lot of things. And I'm not a particularly good photographer, so getting a good photograph as a reference is one of the difficult parts for me. The advantages of working in a studio, and working from a photograph or still-life setup, is that it doesn't change. It doesn't move, the light doesn't change, the direction of the shadows doesn't change. If you have a model, she's going to sit there as long as you tell her to. Plein air, everything's changing and busy and moving. So you have more luxury of time working in a studio. You can really take your time and study the reference and make changes as you see fit, whereas outside you've got to make things very fast and work very fast and very focused, as one of my teachers used to say. It does have all that extra stimulation which makes it very exciting. Susan works in watercolors, using many different brush widths to bring color to the canvas. I did enjoy the interaction of visitors for the most part. It's great when people come over and tell you how much they like the painting - it's always a good feeling. And there was one particular person who, when he walked by, said that it was just how he thought of what I had painted. I think it was the painting I did of the Reading Room. He said, "that's exactly how I think of the park. It's just how it looks to me in my mind." So that was a great compliment, and it made me feel good that I had captured some essence of the place for him. That was probably my most memorable interaction. 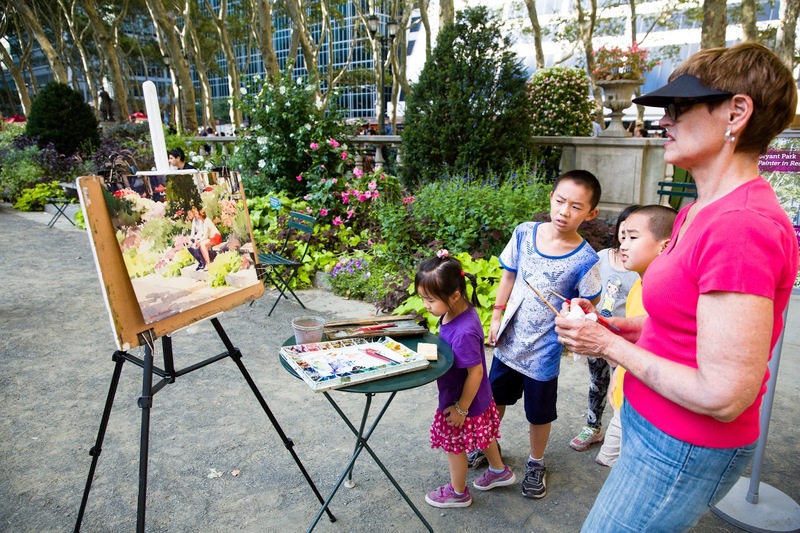 Susan enjoyed engaging with the public during her time in the park. Photo by Angelito Jusay. If you missed the first three painters, you still have a chance to watch Brad Marshall at work from September 14th-25th. Susan Weintraub earned an MFA at Brooklyn College and taught art in city schools for 25 years. 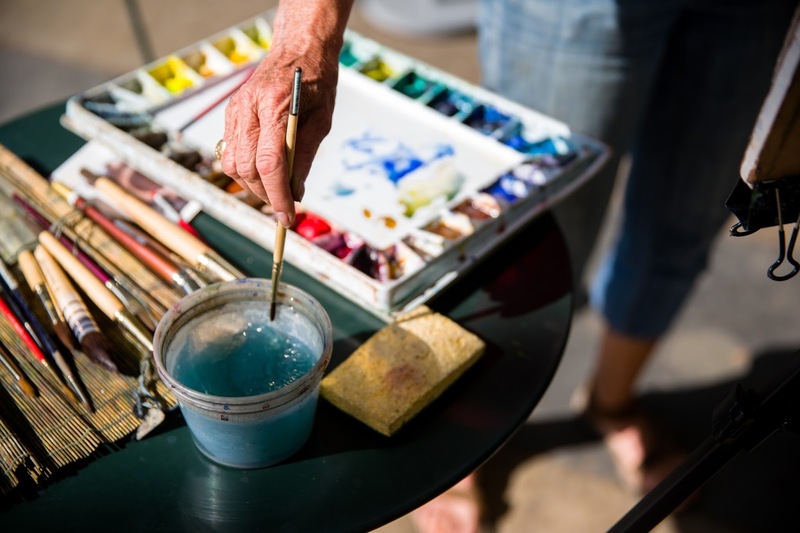 For the past 11 years, she has studied watercolor at the Art Students League, where for each of the past four years, she has received the League’s ‘Red Dot,’ an award given to the best individual work in each class. 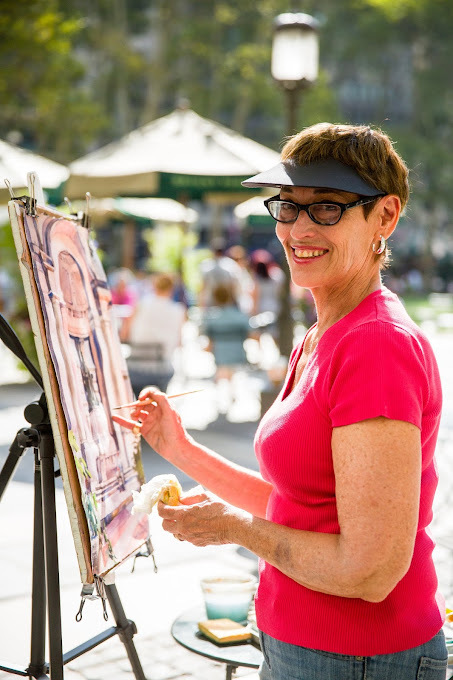 In 2014, she became a signature member of the North East Watercolor Association. Her work has been exhibited at the Salmagundi Club, the National Arts Club, the Kent Art Association, and the Old Lyme Art Association. In 2012, the Arts Student League purchased one of her works for display in its permanent collection, joining fellow ASL alumni Winslow Homer and Georgia O’Keefe.